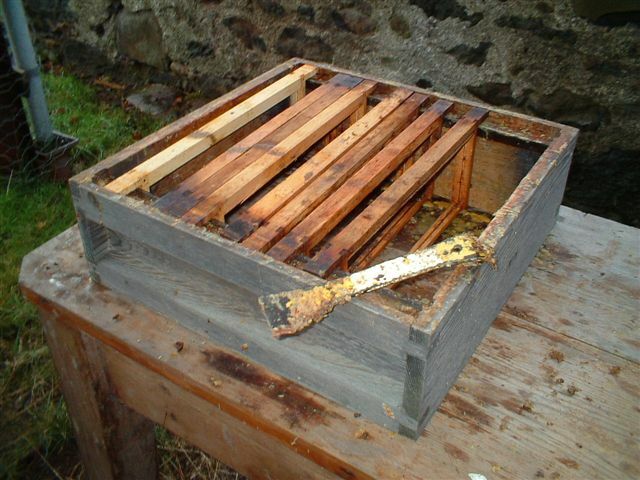 Cleaning beehive frames is a good job to do outdoors on a frosty winter morning, when the bees are not flying. Wear old clothes, eye protection, gloves and Wellington boots. You may get splashed with hot wax. Never buy or sell secondhand empty frames for reuse. It’s a surefire way to spread bee diseases. Burn them. Click here for BeeBase Best Practice guidelines. Secondhand boilers must be tested by a competent electrician or Gas Safe engineer before use. Do not leave the boiler switched on and unattended. I usually boil up about a hundred shallow frames in one session. This takes about two hours, including warmup and tidyup. 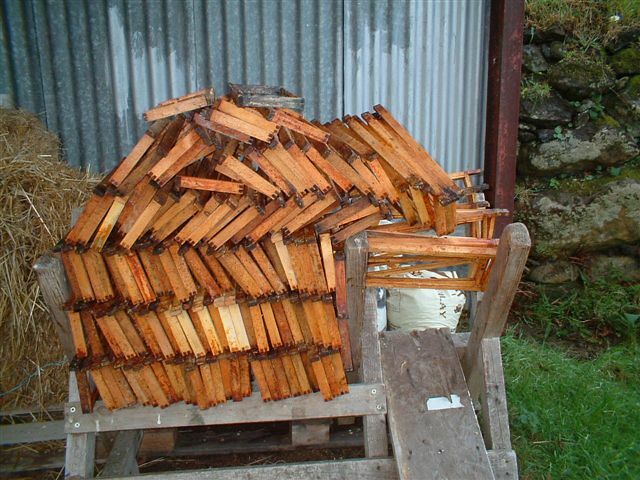 Most of my frames have been used for heather honey, and I’ve cut out the combs to press out the honey. 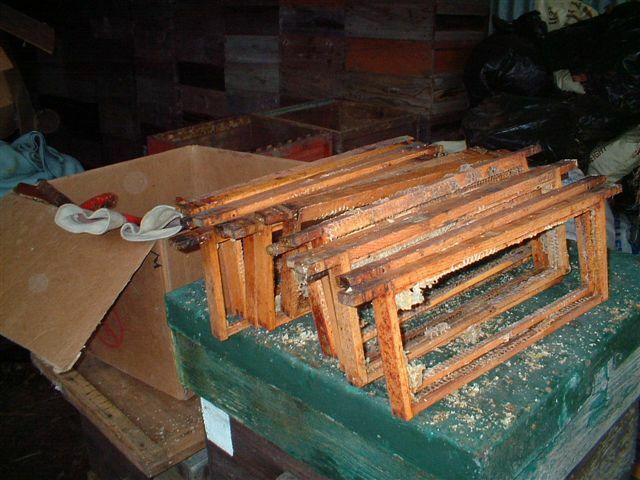 I give the frames back to the bees to clean out any vestiges of honey. 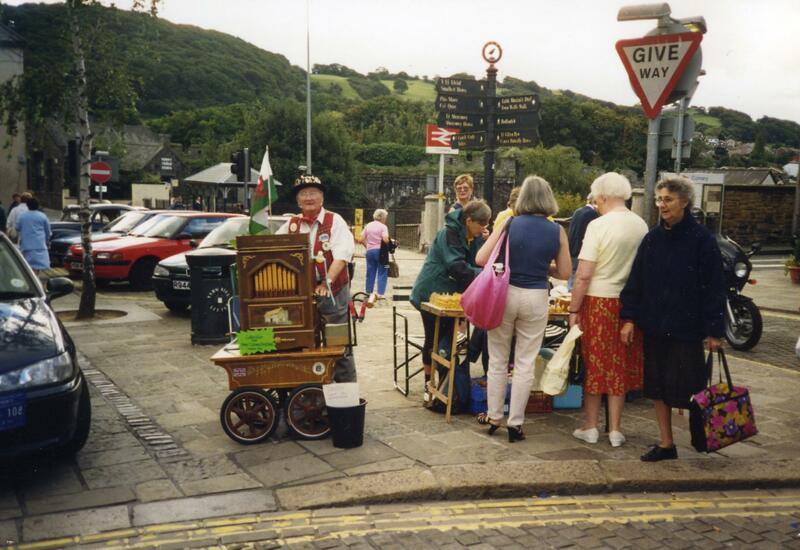 Some beekeepers add washing soda to the water, but I just use hot tap water, which is very soft here in north Wales. Half fill the boiler with hot water and allow to come to the boil. Wash six to eight shallow frames at once, depending on the size of the boiler. Dunk one end of the frames in the boiler for a couple of minutes. Lift the frames out, shake excess water and wax back into the boiler. Turn over and dunk the other end, while you scrape the previous batch clean. The scrapings can go back in the boiler. When finished, switch off, carefully wipe the outside of the hot boiler clean, and allow to cool overnight. Drain off the cold liquor and use it on the compost heap. The wax block will have shrunk and should be easy to remove. I usually harvest nearly a kilo of clean wax per 100 shallow frames. I’ve never had problems with wax moth on washed frames, or problems with frames distorting after boiling. 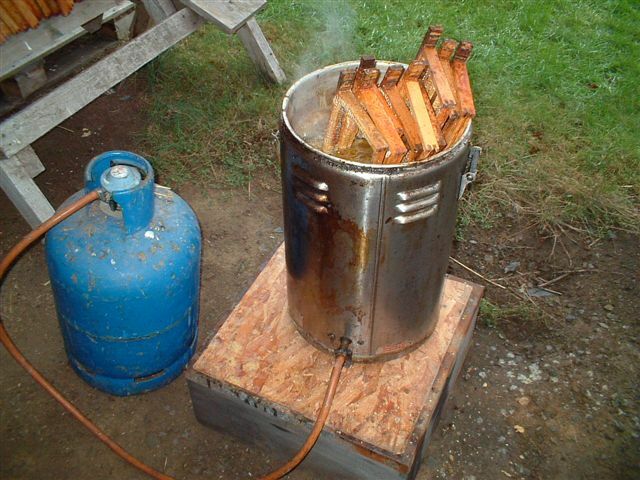 Do you lend out your frame-boiling setup? Sorry no, for hygiene reasons. Amazon offers a low-cost Swan electric boiler or you can search online auctions, your local Freegle website, or car boot sales. Compiled by Peter McFadden, updated August 2017.